Page social media accounts asked for prayers for Sincere Davis, a senior and a running back for the Pirates' football team. GREENSBORO, N.C. — Page High School is asking for prayers for a senior student and well-known athlete on Monday. Social media accounts associated with Page asked that people pray for Sincere Davis, a senior football player. 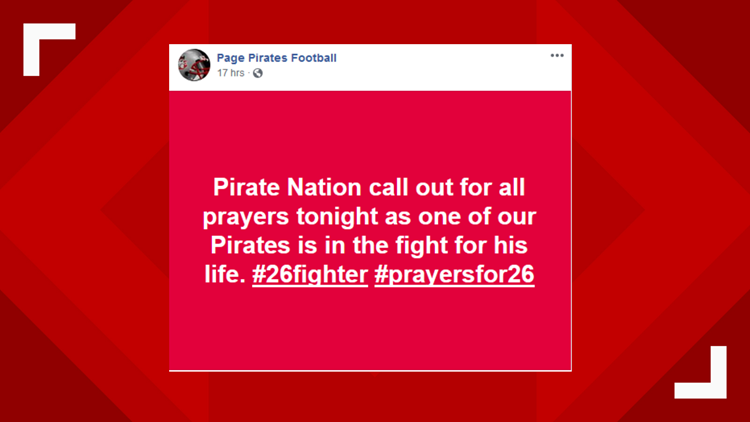 Page Pirates Football posted on its Facebook Page "Pirate Nation call out for all prayers tonight as one of our Pirates is in the fight for his life. #26fighter #prayersfor26"
Davis, a running back, wore number 26 for Page. The team also canceled workouts on Tuesday and Wednesday. Davis had committed to play at Guilford College next year. Page High students WFMY News 2 spoke with said even those who only know Davis in passing are writing him letters and cards. One students said the entire football team visited him in the hospital Sunday night. A Facebook post being shared by many parents of Page football players also seems to confirm Davis is the one who needs the prayers. In the post, it says Davis was shot at close range on Saturday night, he is alive but has a long way to go. These details have not been officially confirmed by police, or the school but we have reached out to police, the principal, the athletic director, and the school system as a whole. School administrators are expected to release more information on Tuesday morning. The Davis family has asked for privacy during this difficult time. Once we know more we will bring you that information.